Last week on RAW: Rollins confronted Balor, Reigns confronted Rusev, Randy Orton RKOed Brock Lesnar (and Lesnar F5ed Orton on SmackDown). Pretty good match. Nothing wrong with it, but I expect these four men will have even better matches over the next few weeks. After the match, Cass gets on the mic and challenges Owens and Jericho to a match at Summer Slam. Owens and Jericho accept. Mick Foley talks to Stephanie on the phone and lies about using the tablet she gave him. Sasha Banks walks up and asks for a handicap match at Summer Slam. Instead, Foley makes a match between Sasha and Dana Brooke for tonight. If Sasha wins then Dana will be banned from ringside for the Summer Slam match. If Sasha loses then the Summer Slam match will be a handicap match. Byron Saxton asks Jorel Nelson why he would want to face Braun Strowman. Nelson says nothing. Same thing as the past two weeks. Squash. At least they’re trying to make it a little entertaining by letting the local talent have a nice moment on RAW. Sean Combs gives Mick Foley front row tickets to a show. New Day (minus Big E) shows up and Woods congratulates Puff Daddy on being an producer of WWE 2K17. Puffy then asks how Big E is doing after the attack he suffered last week. He’s not doing well. An okay match, but this was really just a way to further the feud between Young and O’Neil. Seth Rollins heads to the ring. He has learned a few things in the new era. For one, Balor’s name is made up. That would be like Rollins calling himself “Rambo Apocalypse.” Also, Balor is very disrespectful. RAW is his show. He ended the Roman Empire, and he’s going to become the first Universal Champ. Good match. Pretty hard-hitting, strong style match with a pretty fun finish. A look at the history between Lesnar and Orton. Pretty good match, though it seemed a little disjointed. Neville and Sin Cara didn’t work as a team nearly at all, but individually they were fine. Rusev and Lana head to the ring and celebrate their recent wedding by showing pictures and reciting their vows, until Roman Reigns interrupts the proceedings. Reigns offers to be Rusev’s best man and give them a toast, but Rusev doesn’t want his stupid toast. Reigns then challenges Rusev to a US Title match, but again Rusev refuses. Reigns then goes ahead with his toast to the “Bulgarian sasquatch and mail-order bride.” Rusev gets upset, Reigns is disappointed, and the two guys fight. 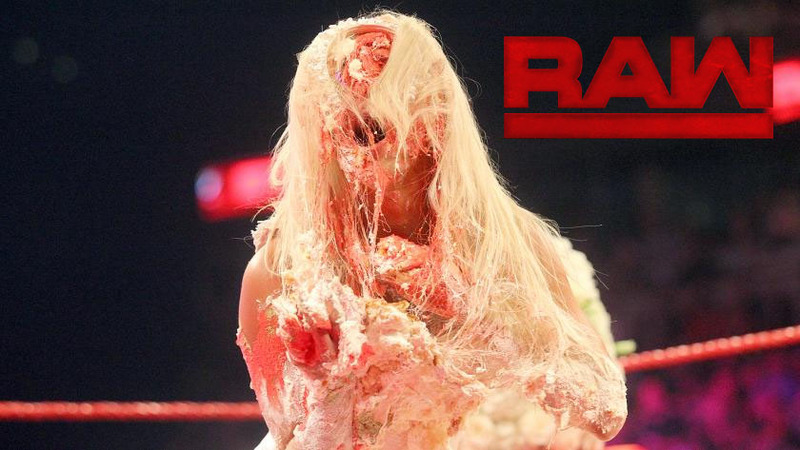 The scuffle leads to Lana getting a face-full of cake. Rusev is screaming at Foley, saying that he needs to do something about Roman Reigns. Foley gives Rusev his chance at retribution, in a US Title match at Summer Slam. Pretty fast and one-sided, but it served it’s purpose and was fine. Nia Jax isn’t like other girls. Finn Balor talks about Irish legends and myths. Anderson and Gallows play doctor and warn the WWE superstars about “ringpostitus,” making lots of testicle jokes and puns. It seemed like they had to abbreviate this match for time. It was super short and not much happened. Golden Truth meet Scooby Doo in the parking lot of the arena. R-Truth is a little jealous of Goldust’s friendship with Scooby, but they end up all going off to watch the new Scooby Doo/WWE movie. Foley heads to the ring and, in the spirit of brotherhood, introduces Daniel Bryan so they can discuss the recent shenanigans with Lesnar and Orton. Foley apologizes for Lesnar invading SmackDown. Bryan half-heartedly apologizes for Orton starting it. Foley then brings up the fact that Bryan made fun of the Universal Title on the SmackDown’s post-show. Daniel tries to justify it, but Foley says it’s a serious deal. Rusev then comes out and says that RAW doesn’t need a new champ because he is the only champ the show needs. Cesaro then comes out and thinks that he deserves a championship opportunity. Foley decides to give Cesaro a shot at the US Title. Right now. I liked this. It came out of nowhere but it made total sense. I think the fact that Reigns has a title shot at Summer Slam hurt the believability that Cesaro would win, but the action in the ring and the reaction from Rusev as he handed the title to the ref at the start of the match got me to buy into it. This was well done all around. After the match, Reigns runs down the ramp and spears Rusev. Not a bad show. I think the whole Bryan/Foley thing was a bit underwhelming and a lot of the matches were lacking in length, but I still enjoyed the show. Easily the best, most exciting match on the show. Most of the matches were for storyline purposes (at the expense of wrestling), but this one managed to have good wrestling and further two stories.